It was the minaret of this mosque which we used to guide us through Marrakesh, at least when we were in the Medina. It is the most important mosque, the inspiration to build the Giralda, and non-Muslims can not enter. However, they can admire the outside beauty of this XII century Almohad construction. Their gardens can also be accessed without any problems. The Koutoubia is next to Mohamed V Avenue which takes you toward the new city (Gueliz) and also the area known as modern Hivernage. Besides these things, it is practically next door to the famous Djemaa el Fna market and the souks. The Koutoubia is a magnificent 12th century Almohad mosque which is a global reference in architecture. It's also closed to non-Muslims so those of us ve aren't Muslim can only admire it from the outside. You'll notice that you can see it from most anywhere in the Medina and that it makes an excellent landmark to find your way to Jemaa El Fnaa (if you're in Marrakech for only a few days, your general rule of thumb for finding anything is "towards the square" or "away from the square"). 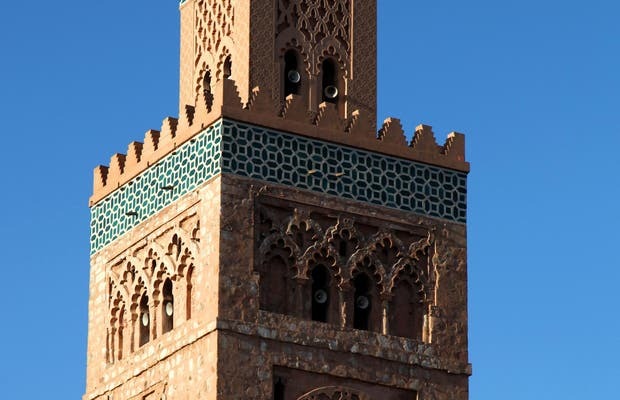 The gardens around the Koutoubia are free to visit and let you admire the details of the famous minaret up close.